Businesses are set up to make money for their owners. The business must continue to make money to stay in business. This "money" that the business makes is determined by how much money the business takes in, minus how much the business spends to make this money. All three terms mean the same thing - the difference between the gross income of the business and all of the expenses of a business, including taxes, depreciation, and interest. Net income is the same as the "profit" of a business, or its "earnings." 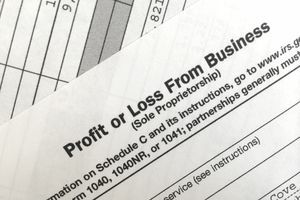 For all of these terms - profit, net income, or earnings - we are talking about a net amount, including both the income (revenue) of the business and deductions to that income. What If the Business Doesn't Make Enough Money? The opposite of net income is a net loss. In this case, the expenses and other reductions are greater than the income of the business. Then, to get net income, you must deduct withholding of income taxes, deductions for Social Security and Medicare taxes, and other pre-tax benefits like health insurance premiums. The term "earnings" is a special case because it can be used for both businesses and individuals. An individual can have earnings from wages or salary or from other payments. For example, you can have Social Security earnings, which are credited to you toward your Social Security benefit. For an investor, earnings can be compared to the price of a stock, in a price to earnings ratio, to get the relative value of a stock. For a business, the term "earnings per share" is a way to measure the health and profitability of the company. Earnings are shown for individual shareholders and for the corporation as a whole. The term "earnings per share" relates to how the earnings of a corporation are divided among the individual shareholders. Net income is used for businesses. A business shows the calculation of net income on a financial report titled a "Net Income" or Profit and Loss financial report. Again, since the terms mean the same thing, either title can be used. The expenses of the business are shown, in alphabetical order. These are all the legitimate business expenses. Any depreciation expenses and taxes are shown as separate deductions. After all the calculations, the resulting figure is the net income or profit or earnings of the business. To determine tax for individual partners and LLC members and for S corporation owners. These business owners report their share of the income from the business on Schedule K-1 on their personal tax returns. To determine tax for corporations.